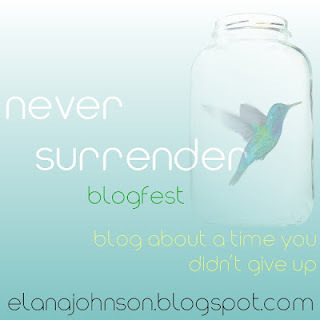 Today I offer for your enjoyment my entry in Elana Johnson's Never Surrender Blogfest, celebrating the release of her second novel Surrender. This week participants are supposed to blog about a time they didn't surrender. Trained for a marathon? 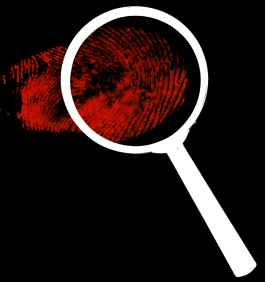 Queried agents? Had to study for an entrance exam? She is looking for inspirational stories that her readers might have experienced. Once again, I'm bending the rules a bit. Instead of discussing a specific experience, I'm going to let you see how I acquired this trait in the first place. Although a lot of memories from my past are cloudy at best, I can recall this just as clear as the memory of pouring my last cup of coffee. I can remember the exact spot as well...underneath a '57 Buick. There are those that would say never giving up, backing down from a challenge, or stick-to-it-ness, is just a result of being stubborn. Fair enough. I can see where some might believe that. Personally, I feel that it takes an equal portion of discipline inter-mixed with that obstinate reaction to resistance, to truly overcome obstacles. My exposure to that kind of discipline came from my father. He was a military man, in the Navy for 25+ years. He went in as an enlisted man and retired an officer. My dad was a strict disciplinarian who kept few secrets (or held them so well I still don't know them) and you always knew where you stood with him. But it wasn't his ties to the military that taught me the most about discipline, but rather cars. His passion was working on cars. He learned that skill from his own father, who operated several used car dealerships throughout the years, some of them out of his front lawn. Automobile repair was a necessity in his family. Although my dad tried his hardest to pass that skill on to me and my brothers, with me it was time wasted. I wasnt interested in spending my Saturdays tooling around with broken down relics, but that didn't stop him from trying. As it turned out, I did end up learning something invaluable from him. On one particular Sunday afternoon Dad had me with him underneath the '57 Buick he had been restoring for months. Living in military housing, we had no garage to shield us from the weather while we worked, so together we endured the chilly temperatures, drizzly rain, and irritation of sharp pebbles from the street pushing into the back of our heads. Needless to say, I wasn't in the best of moods. We had been trying to replace the starter on the Buick for days but were having difficulty removing this one tricky bolt. It was in an unworkable angle where getting a tool on it was next to impossible, and when you did it wouldn't budge. I had given up on it long ago, content to have the car towed to a shop and let a professional have a go at it. But not my dad. Not him. I laid there as hours turned into days, watching him try tool after tool, angle after angle, position after position, all with the same result. And my resentment of him grew with every passing minute, every piece of grit that fell in my eye, every shiver that went through my body from the wet and cold. I couldn't believe it when that bolt finally turned. I cried out as if the prettiest girl in school had just agreed to go out on a date. My surprise and jubilation was unrestrained. But my dad just removed the inflexible bolt and simply continued on to the next task. For him, it wasn't shock...but an expected result. It had just been a matter of time, determination, and discipline. I learned something that day, and continued to see it time after time as I watched my father come up against persistent bolts, or screws. No matter the time involved, he would crack the obstacle. EVERY SINGLE TIME. There continued to be occasions when I'd be laying there beside him thinking its time to throw in the towel, or resort to dynamite (kidding - of course), but he stay with it until he conquered the impossible. Over time my resentment turned into admiration, and although I never did come to enjoy working on cars, I did enjoy seeing that side of my father. I was in awe of that quality in him, and found myself trying to emulate him in my own way. It's important to point out that there were times when father did seek the help of others. He would recognize those situations in his life when he didn't have the requisite skill or know-how to do a job, so he would seek the help of experts. But where cars were concerned, he was the authority and he was always going to see it through to the end. That's something else I learned from him. Seeking help from others is not surrendering. Whenever I can, I try to become an expert so I don't have to relinquish control, but there are times when that is just not possible. There is no need to surrender, when you have friends! This post brought back memories of holding tools, etc for my dad as he repaired every old car he owned in my younger days. Your post is a wonderful testament to tenacity. Moving story, pardon the pun. It also says something about your character. Other kids would have been consumed with resentment rather than admiration. And brave you for another blogfest. Hanging outside in the elements to fix a car I don't care about would have made me cranky too. Great story, Don!!! I tell you -- you really have a gift for inspirational writing, my friend! Your experience is a great analogy to our writing and so true. We need to expect to succeed, simply being patient for it's arrival. Great story! And what an important lesson to learn at a young age and carry it with you for the rest of your life. The secret is knowing when we can win and when we can't. That car would've beaten me before I even began. DL, I've been there working on cars. One bolt standing between you and success. It must have been a great feeling and a good analogy. Oh, I remember those days of taking a part a carburetors on the kitchen table with a layer of newspaper laid down. Dad did much of his own repairs on his car, too. Being the oldest, I helped. So did mom for that matter. Knowing when to ask for help is an important lesson. I like that to your dad, it was just a matter of time. If more of us thought like that ... just THINK of where we could be! My father possessed similar qualities. A carpenter by trade, he was methodical and persistent. I love this! You really pointed out that it's the small things that really matter. Most of us, when thinking of not surrendering, think of a big moment in a movie or a big battle, but the battles are truly won in the little moments. Thanks for writing this! It’s great what we can learn from our dads! This is a great post! I have learned so much from my dad as well - none of it about cars though. Aww! Great story. It reminds me when I had to change my flat tire. It took well over an hour to get those bolts loosened, but I finally did it. Nice story! I love how he wasn't surprised, how he expected success. That is a powerful state of mind. Cool story indeed. Expected results. Yeah, I like that. Too, it takes someone with enough discernment to know the difference between "Can Do" and "I better get some help." It sounds as if your father has the perfecta, that is, the aforementioned two and a son who DID learn a valuable lesson. What a wonderful post! I love the message - and you learned such a great lesson. What a neat lesson you learned! I've watched my husband do the same thing when working on cars. It always used to frustrate me too. You just made me look at it in a new perspective. Thanks. I've tagged you in an award, over on my blog! What a wonderful story! It’s amazing the vital life lessons we learn as children—unexpected lessons learned from seemingly simple experiences. Those unforgettable memories help to build our character. 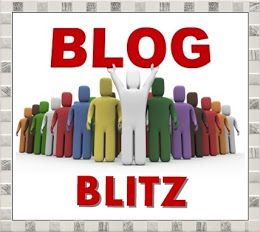 Stopping by from the blogfest...Great story! I love the father/son moment! I also love your point that every strong and stubborn person knows when to ask for help - at least the really smart ones. Thanks for sharing! This is such a great memory and beautiful life experience. I think you unlocked more than a bolt that day. Great story! What a great story. My favorite part of it is how resentment turned to admiration. It's also pretty cool that your dad's "expected result" wasn't surprising to him. Both are things that I'd like to see in my life. "No matter the time involved, he would crack the obstacle." That's a powerful thing he was passing on to you. Oh, that tenacity! That is great to see that with enough persistence you can do what you need to do. This post brought back a lot of memories for me. My dad was an airplane mechanic who fixed everything . . .except computers. Due to his disabilities, he had to find ways to work out problems with cars and other vehicles that put the work on the tool and not on him, but he always figured it out. And when it came to computers, he just asked a friend. My dad was a doctor. He never let me help. Loved that you and your dad shared the "go" moment. This is a wonderful story, DL, and I love the way you interpreted the Never Surrender challenge. I don't know if I've ever stopped to consider where I got my ability to persevere. And I like the distinction you draw between dedication and stubbornness, and knowing when to have faith in your own abilities and when to ask for help. "Seeking help from others is not surrendering" - I wish this was said more often and more loudly, especially in the context of working hard on a challenge. Your dad sounds like an inspiring man. That level of patience and perseverance is definitely a good thing to have! A good thing your eyes were open (and willing) to receiving this life lesson. Your dad sounds like a great man! Love this angle to the surrender topic! Being able to reach out to friends is DEFINITELY a strength.